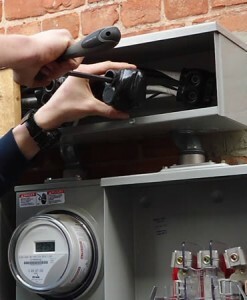 Whether you are a metal processing company, photographer, osteopath or beauty salon, at some point you will probably need to find a local commercial electrician to carry out an upgrade to your fuseboard or do some rewiring. South London electricians will offer you honest and accurate advice on which of these are appropriate for your Purley business and give you an idea of how much you can save each year. This may sound strange but the advice given by your electrician could help to promote your business by making your premises more attractive to customers. For example, for a beauty business a state of the art sound system with a new LED lighting system would really make customers feel welcome. For a retail unit in Purley, LED discreet shelf lighting with top quality high bay and low bay LED lighting units would make your sales area light and bright, putting customers in the mood to buy. Your business deserves a service provider with qualified staff so that any equipment installed or rewiring is safe. But how can you find one? There are a number of commercial electricians in the Purley area so you need to do your research carefully. You can carry out this research either on-line or using traditional methods like the phone book. Make a list of possibilities ans then check out their qualifications. Look for electricians who are members of Trustmark, the Electric Competent Person Scheme and NICEIC. These bodies require a financial commitment and monitor the quality of their members. Chatting with other business owners can quickly identify reputable and reliable electricians, as can using independent review website like checkatrade. Once you have shortlisted some electricians, talk to them about what your requirements are. Here at South London Electricians, you will always talk directly to a qualified tradesman and not to a receptionist. You benefit from immediate advice, saved time and getting to the heart of the matter straight away. Why choose a local commercial electrician? A local electrician is generally a better bet than a national franchise or company from the other side of London. They are readily on hand and have their local reputation to keep so you are more likely to get a better and more efficient service. And should you experience an emergency situation such as a switchgear failure or power outage, they can be on site very quickly. South London electricians are THE commercial electricians of choice for Purley. We install energy efficient lighting for offices, retail units, car parks, light industrial units, warehouses, cold stores and factories; change fuseboards; install high current three-phase electrical machinery including catering equipment; carry out partial and full rewiring of commercial premises; install switchgear, back-up generators and armoured cabling plus flameproof wiring for paint spray booths, MoT bays and more.